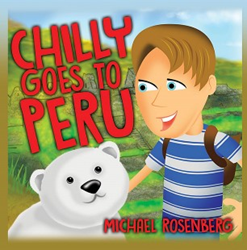 Author Michael Rosenberg's new book finds Chilly the toy polar bear on an action-packed adventure in Peru. Chilly the toy polar bear and his friend Douglas are heading out on an action-packed adventure to Peru. There they will learn about the native animals, including spectacled bears, which boast black rings around the eyes. These are the only bears native to South America and are far distant cousins to Chilly. When the family takes a boat down the Amazon River, they’re warned to keep their hands out of the water because there are over 5,000 types of fish, including the flesh-eating piranha. Other swimmers include massive anaconda snakes and botos, river dolphins that grown to almost 8 feet in length! On the two-day hike to the Incan ruins of Machu Picchu, way above the jungles below, Chilly meets a spectacled bear that takes the toy polar bear to meet his family, who live high up in the trees. Will Chilly ever get back to his own family, who are now far away from him in a strange country? “This exceptional illustrated children’s book takes an exciting and educational trip to Peru. We are proud to be the publisher,” said Robert Fletcher, CEO of Strategic Book Publishing and Rights Agency. About the Author: After growing up in North London, Michael Rosenberg spent his career as an entrepreneur specializing in the media and healthcare sectors. He traveled the world on business and acquired many stories along the way from his experiences in developing countries. He was awarded an OBE by Queen Elizabeth in 1994 for services in developing UK exports. He now serves as an adviser and director on several public listed companies, and is an adviser to the Princes Trust, where he helps mentor aspiring young people. http://sbpra.com/MichaelRosenberg or at Amazon.com or Barnesandnoble.com.